Have you ever been down at the pub with a few empty pints littering the table and come up with the best idea of your entire life? I’m sure that’s the beginning of many million-dollar-ideas, the genesis of many short-lived bands, and the starting point for many road trips. Ben Coombs’ pint-fueled idea was to drive to another pub to get another pint. A lot more pubs and a lot more pints. 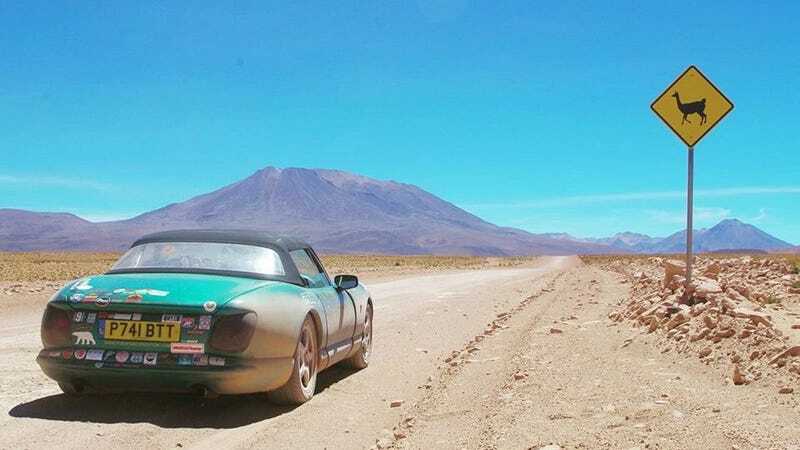 Ben’s adventure involved driving more than 25,000 miles in his twenty-year-old TVR Chimaera over seven months from the northernmost bar in the world, to a dive bar at the southern tip of Chile. Unbelievably, the Rover V8 held together and didn’t break down much in that huge journey, and he’s just finished the trek. Now prepared to ship the car back to the UK, Coombs is proud to have completed what has become his magnum opus. The journey began in earnest at the hotel bar in Pyramiden, Norway. The hotel is the only remains of a Russian coal mining operation that has long since been gone. The town, on the island of Svalbard, is only 700 miles from the North Pole, and the northernmost civilization, if you can call it that. From there, the route took Coombs down the Scandanavian coast, across Europe and back to the UK. Once there, he scheduled a ship to take his car to New York, and he flew to Cuba. Once rejoined with the car, he drove across the US to California before heading south. The tour ended at a dive bar at the southernmost tip of Chile. This run is being called the longest road trip ever driven in a sports car. Whether true or not, it is probably at least worthy of the term ‘epic’. Cars can absolutely change your life if you let them.